If it’s an official police or military checkpoint, you better stop. Despite what you see in movies, blowing through a police blockade is not a sound strategy: you can kill an officer, get shot yourself, and even if you get through, the authorities will be after you like white on rice, inevitably nabbing you in the high-speed chase that follows (if you don’t end it yourself by crashing). But what if the blockade isn’t an official one? You’re in a war-torn foreign land and are about to be stopped by insurgents, or it’s a trap set up by carjackers, or you’re living in a Mad Max-esque dystopian future where some baby-eating cannibals see your car as a can full of tasty sardines? Well, then it might be worth ramming through the obstructing vehicles and continuing on your way. Ramming a vehicular barricade is very dangerous, and should only be employed as a last resort — when there’s no other means of escape or alternative routes of navigation, and when breaching and stopping carry about equal chances of death. 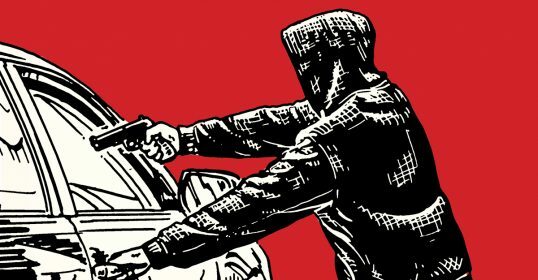 In such a situation, here’s how to most effectively carry out this defensive driving maneuver. When it comes to the best kind of car for ramming through a blockade, not all vehicles are created equal. You want to think both about its frame type and its air bags. Vehicle frame. Vehicles are basically built with two types of frames: body-on-frame and unibody. With the body-on-frame build, the vehicle starts as a separate frame to which the body is attached. With a unibody car, the frame and body are integrated together. A body-on-frame chassis is made with heavier metals, while a unibody is made with lighter weight alloys. 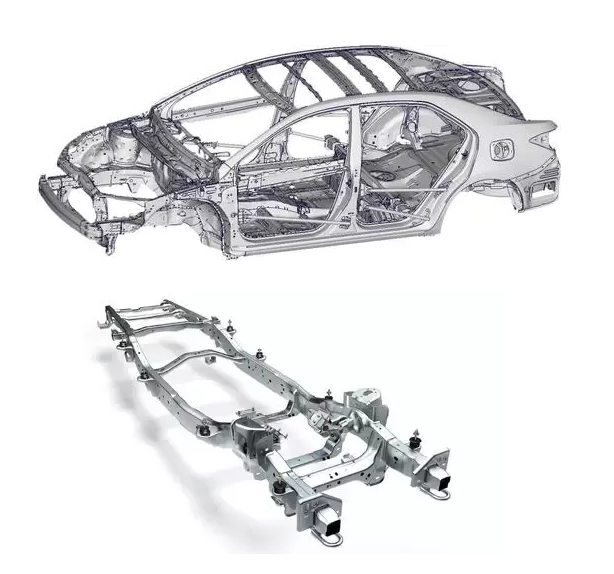 In a unibody car (top), the frame and body are all one structure; in a body-on-frame vehicle (bottom), the body goes on top of a separate frame. 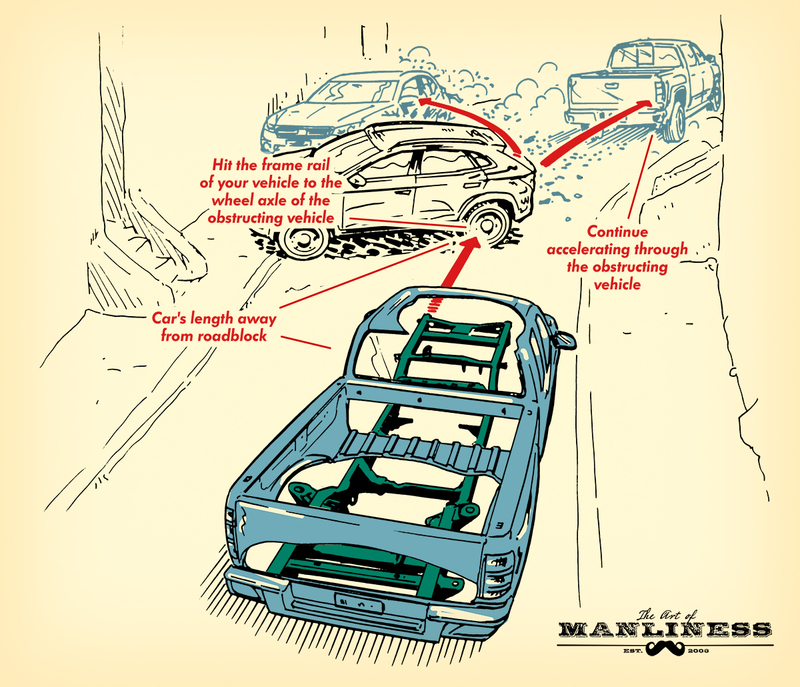 A unibody vehicle is statistically safer than the body-on-frame type because in the event of an accident, the stresses are evenly distributed throughout the vehicle, which is actually designed to crumple, even in a minor crash, in way that redirects the forces away from the passenger cabin. But the reason they’re safer in a normal accident scenario also makes them less effective in a ramming situation. 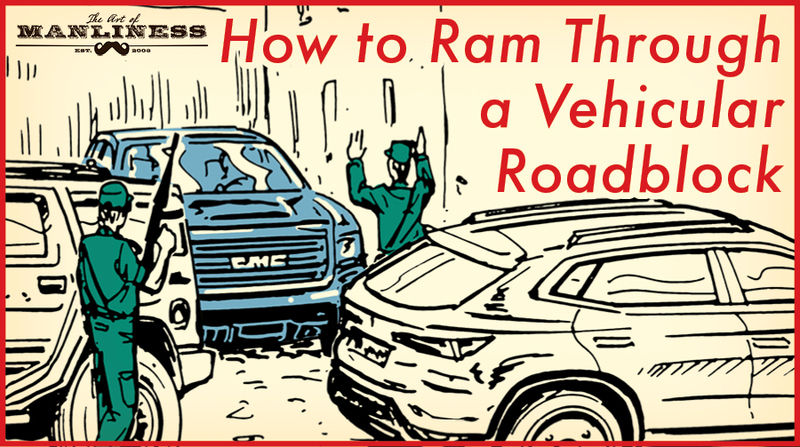 The key to an effective ramming is to hit a hard part of your car against a hard part of the obstructing car; this works better than a hard part of one hitting a soft part — like a crumple zone — of the other. You want the energy from the contact to move/bounce the obstructing car out of the way, rather than being absorbed. A body-on-frame vehicle provides this desirable rigidity because the chassis is made with high-strength steel frame rails that run the entire length of the vehicle. Rather than being distributed throughout the body, contact forces will be concentrated in the frame, making for better bumping. Almost all vehicles these days are made with unibody frames except trucks and a few heavy-duty SUVs. While a unibody car is capable of ramming, a body-on-frame truck will have tactical advantages in this (and in off-road capabilities as well). Air bags. You should also keep air bags in mind in a ramming situation. Below we’ll talk about how to minimize the chance of the air bag being deployed, but it can certainly still happen when you’re hitting another vehicle. Getting smacked in the face with an air bag when you’re trying to make an already dangerous maneuver is obviously highly undesirable; it would not only be a painful, view-obscuring distraction, but the release of an air bag can also trigger the automatic shutoff of your fuel pump. For tactical purposes, you might choose a vehicle that’s too old to have an airbag, or deactivate the air bag (something you’d have to do yourself, as you’re required to request authorization from the National Highway Traffic Safety Association to have a mechanic install an on/off switch for you). Remember, ramming through a vehicular blockade is a maneuver of last resort. As you approach a checkpoint/roadblock, assess whether or not there’s an alternative way to avoid it. Can you go around it? Throw the car in reverse and back away? If there’s no other way through, and death awaits if you stop, then it’s time to ram the car(s) blocking your path. Line up so that the frame rail of your vehicle will hit the wheel axle of the obstructing vehicle. Remember that you’re going to aim to hit a hard part of your vehicle, to a hard part of the other car. The best points of contact are the frame rail of your vehicle, and the wheel axle of the other. The frame rail runs roughly parallel to your headlights; as that’s hard to see when you’re driving, use your outside leg (or that of your passenger if you’re hitting with the other side of the vehicle) as a reference. Even in a unibody car, this will still be the strongest spot to use; while it doesn’t have frame rails that run the whole length of the vehicle, there is a sub-frame in the front and the rear. Aim for the rear wheel of the obstructing vehicle if possible. The trunk end of the car is lighter and easier to move than the engine-heavy front end. If there are two cars, aim for the wheel axle of one of them. A blockade often exists of two cars parked end-to-end. In this case, aim to drive between them, hitting the wheel axle of one of them. Drive at around 15-20 mph. Approaching slowly will make it appear you intend to stop at the checkpoint, and it’s also the ideal ramming speed. You need less speed and force to move a car than you’d think. By applying this “minimum effective dose,” you 1) minimize the damage to your own car (preserving its integrity will be key in making your getaway), and 2) minimize the chance of the air bag deploying. If you have air bags in the car, slow down to 15 mph. Air bags are triggered from rapid deceleration, and the kind of impact/body damage which occurs when you hit another car going at least 16-28 mph. Going slow will hopefully prevent the air bag from deploying, as will continuing to accelerate (see below). If you have to stop completely before the blockade, leave a car’s length between you and the obstructing vehicle. A car’s length to a car and a half’s length will give you sufficient distance to get up to speed before you hit the obstructing vehicle. Put your car in a low gear, so you’ll have plenty of torque. Look ahead. 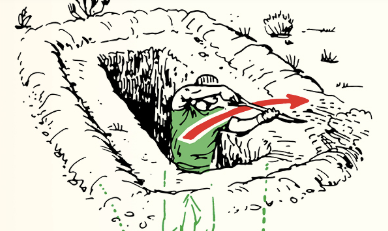 Don’t stare at the target of impact, but instead look ahead to see where there’s drivable terrain past the blockade and figure out where you’ll maneuver next. 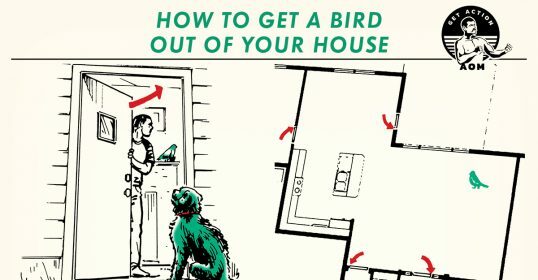 Maintain situational awareness! Keep accelerating through the obstructing vehicle. Human nature will prompt you to take your foot off the accelerator or to pump the brakes as you hit the obstructing car. Do neither. Keep on accelerating as you hit the car and break on through. Congratulations, you just rammed through a vehicular blockade. The baby-eaters will go hungry another day.